Several months ago I blogged about an Aran sweater I was knitting with my homespun; that one still sits on the shelf because I screwed up in the knitting of the center panel and it biases so badly, it’s not savable. But, I spun this yarn knowing I was going to make myself a sweater with it, so I’ve been fiddling, sampling, and searching the patterns on line and in my collection. Every last one is (of course) designed for commercial yarns, with their perfectly smooth and even qualities. 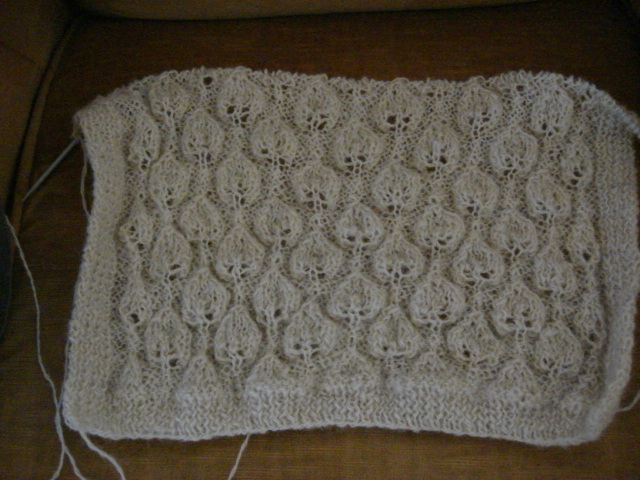 Which means that I have to swatch, knit a sample, take a look at it, fiddle with the pattern, and sample some more. Everything I tried just looked wrong. So. I’ve been completely taken with the foliage theme in my knitting lately, and the leaves turned out so well for the scarf that I adapted it (again) for my sweater. I put ribbing on the sides so it will be a little closer fitting; I love sweaters but I hate looking even heavier than I am, so adding ribbing will give it a little ‘cling’ and show my curves without making it a tight fit. If it turns out really spectacularly I may put a pattern on Ravelry for it. ← What?? Californians are hypocrites?? Say it isn’t so!